Commissioned in 1919, the stadium’s grand opening was held on October 6th, 1924. 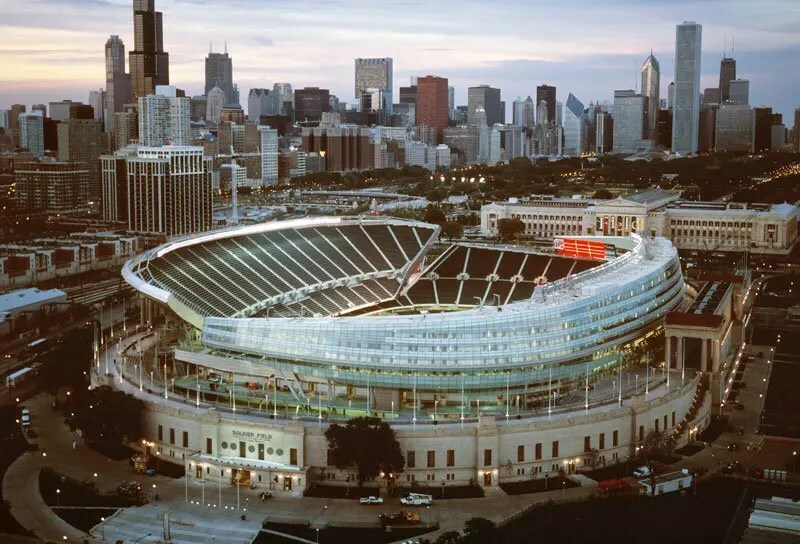 It was originally named the Grant Park Municipal Stadium, but was re-named Soldier Field a year following its opening to support Chicago’s Gold Star Mothers (the American Gold Star Mothers Club provides support for families whose children died in service). The stadium can hold 61,500 people, and is home to the Chicago Bears, making it the oldest NFL stadium in the nation. Aside from sports, Soldier Field is also a popular concert venue, with performances by artists ranging from U2 to Taylor Swift to Kenny Chesney – and Spring Awakening has been held there since 2012! The stadium has also hosted stock car races, fireworks displays, rodeos, circuses, open-air operas, and marching band concerts over the years. This year SAMF will be featuring a different branded stage each day of the festival! Friday’s Trance Arena stage will be headlined by Grammy-nominated German artist, producer, and DJ Paul Van Dyk, along with Cosmic Gate, Andrew Rayel, MS54, and Ilan Bluestone. On Saturday, the Bass Kitchen stage will host British DJ and producer Zomboy, Bro Safari, Brillz, Figure, and Grandtheft as headliners. And make sure to check out the Beatport stage Sunday, with headliners such as Hot Creations founder Jamie Jones, MK, Cajmere, Justin Martin, and Derrick Carter. Check out the full lineup and create a custom schedule! 3) What’s more fun than a silent disco? A crowd favorite, the Silent Disco returns to SAMF 2015! This is the perfect opportunity to don some headphones, make new friends, and get crazy on the dance floor. There’s a beat for everyone, with over 15 different DJ sets to jam to throughout the weekend. Take a look at the silent disco lineup and get ready to dance! Like fans of any other music festival, SAMF attendees love to get creative with their festival outfits! News outlets such as RedEye Chicago and the Huffington Post have covered Spring Awakening fashion in previous years, with photo sets featuring the best and most outrageous outfits of the weekend. Aside from the festival fashion staples (short shorts and bandanas, anyone? ), there have been some notable trends during the past few years. Flower crowns and animal hats were popular accessories for SAMF 2013 , while SAMF 2014 brought a retro vibe, with neon colors making a major comeback. We can’t wait to see which fun trends will dominate Spring Awakening 2015!! One of the best things about SAMF each year is the atmosphere. For many festival goers, Spring Awakening is a weekend of freedom. For three days, everyone is welcome and free to be themselves in a community of like-minded people. So wear a crazy, ridiculous outfit. Make friends with strangers. Scream until your voice is hoarse. Dance like nobody’s watching. Party into the night with your favorite artists. Live in the moment. Let’s get pumped for SAMF 2015!! I'm Elaine! Music, fashion, and writing are my passions (not necessarily in that order). Chicago is my home.